F.M. Khan (82), former Rajya Sabha member, and a controversial politician hailing from Coorg, passed away on Thursday at his Balayatrie estate near Madikeri in Kodagu. Faiz Mohammed Khan, popularly known as F.M. Khan, was a close associate of former Karnataka chief minister, Gundu Rao who affectionately referred to his mentor as ‘Father Mother Khan’. Khan was part of the Sanjay Gandhi brigade during the Emergency and was allegedly involved in several unsavoury incidents. But Gundu Rao always went to his rescue. He was the general secretary of the state Youth Congress and was a member of the Legislative Council from 1974 to 1976. Khan was elected to the Rajya Sabha twice in 1976 and 1982. He was also associated with various organisations connected with sports. He was vice-president of the Indian Olympic Association. The former Rajya Sabha member was known for his love for gardens and won accolades for maintaining the best garden in Delhi in his MP bungalow. 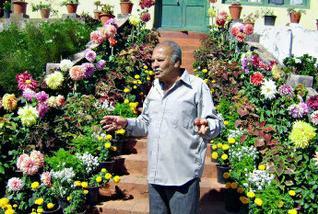 Back in Kodagu after his controversial political innings, Khan had been nurturing his garden and has been holding annual private flower show since 1998. Khan was married to a Kodavathi. He leaves behind his wife and three daughters. The funeral will be held at Rasulpur in Guddehosur in Kodagu on Friday.